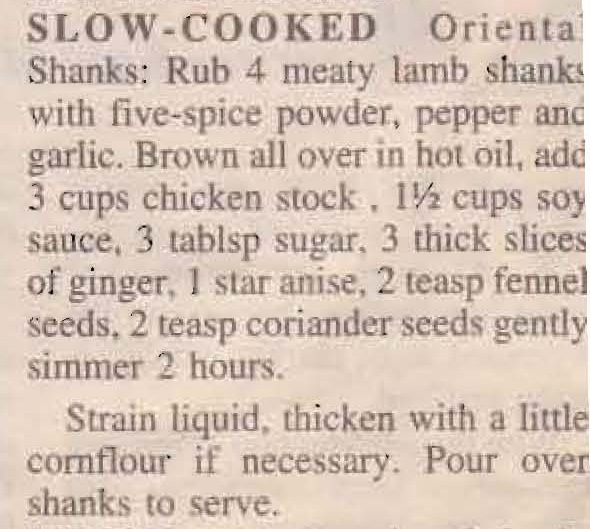 This is another recipe from the Herald Sun ‘The Promised Lamb’ page back in July 1997. The combination of Asian spices with the lamb should be really tasty. This entry was posted in All Recipes, Lamb, Main Dishes and tagged 1990s, five spice powder, garlic, ginger, lamb shanks, slow cooked lamb shanks, slow cooked oriental shanks, soy sauce by bebsrecipes. Bookmark the permalink.